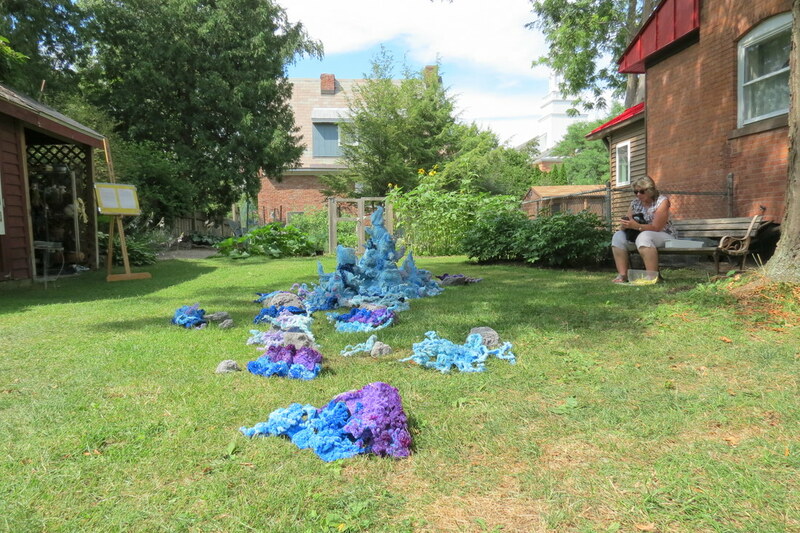 The gardens of the Stockade Association’s 2016 “Art & Nature” Garden Tour sparkled and delighted on Friday (July 15) and yesterday (July 16), enhanced by intriguing and inspiring art. Appreciative visitors came in what looked like record numbers. I want to thank the Garden Tour Committee for letting me serve as a roving photographer. I saw many lovely sites and people I would otherwise have missed this weekend. I hope the following Slideshows, and the random single photos, will capture some of the joy and beauty. 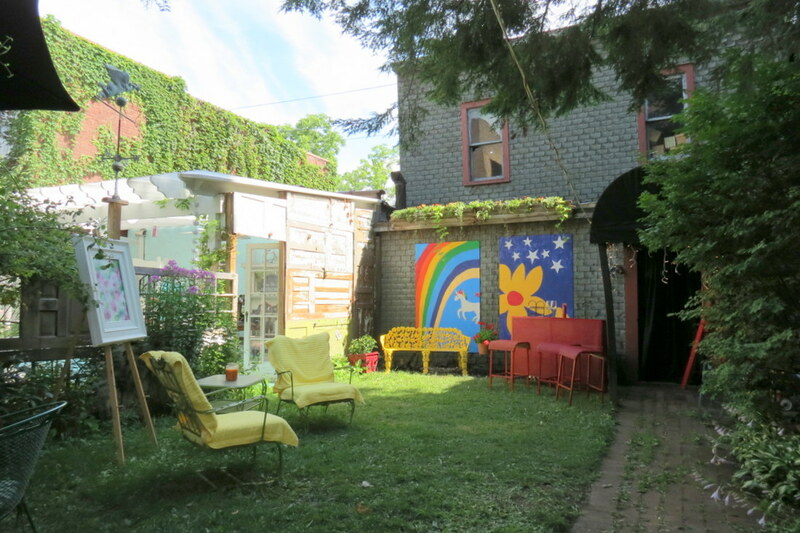 Materials formerly found at “Garden Tour: Day 2, Part 2” and “2016 Garden Tour: a few stops on Day One”, have been consolidated into this posting for the viewers’ convenience.
. share this post with this shorter URL: http://tinyurl.com/GardenTour2016 . This first slideshow features the three gardens clustered at “Katy Lane”: Mabel Leon’s at 20 Front St., Donna Smith’s at 20 No. Church St, and Franca DiCrescenzo’s (Armida Rose) at 22 No. Church St., as well the garden of Katy Kindl (14 No. Church St.), and that of Werner Feibes (10 No. Ferry St.). . . coming soon: light & shadow on Union Street . . 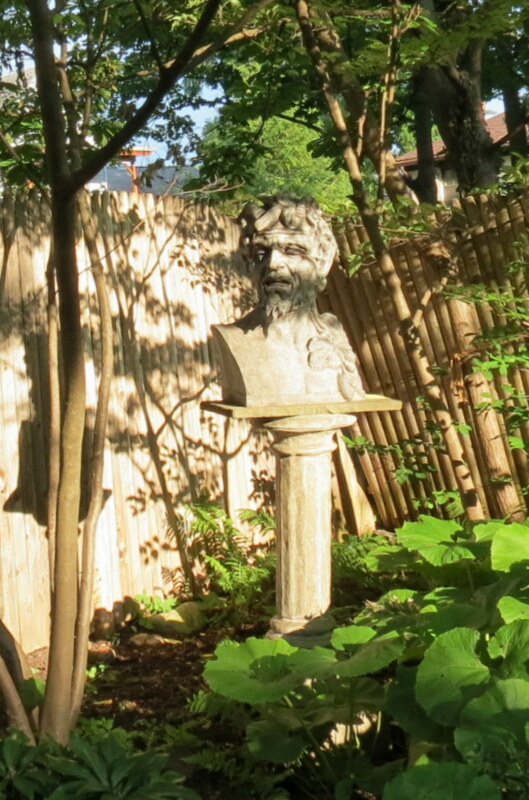 The gardens of Sean and Dan Philpott-Jones (127 N. College St.) and Diane and Ron DeMeo (232 Union St.) are featured in this second slideshow. . . click on the photos from a larger version . . 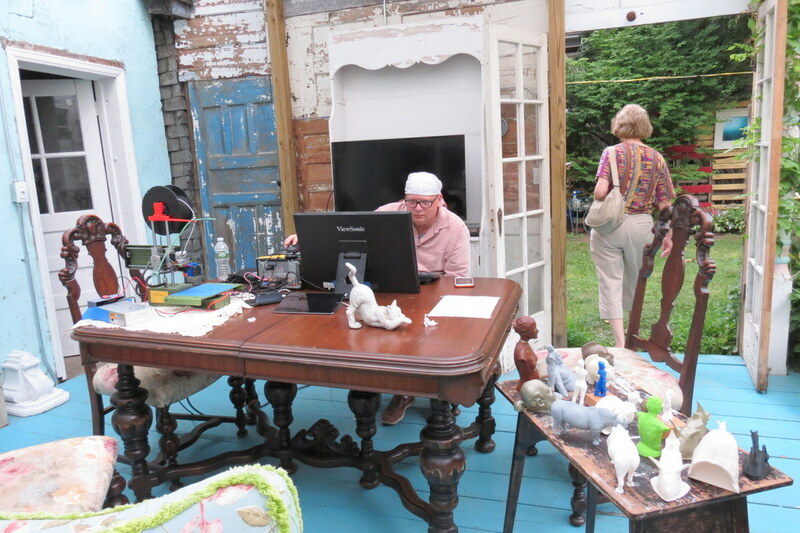 The Third Slideshow below features images from the gardens of Donna & Chris Thomas (234 Union St.), Jorge Luis Alvarez (224 Union Street), Gloria Kishton and Bob Lemmerman (207 Union St.), and Jessica Johndrew and Charles Gelarden (112 Front Street).
. . . [L] Mick Cipollo demonstrated his 3D digital scanning and sculpting in the garden at 234 Union Street. 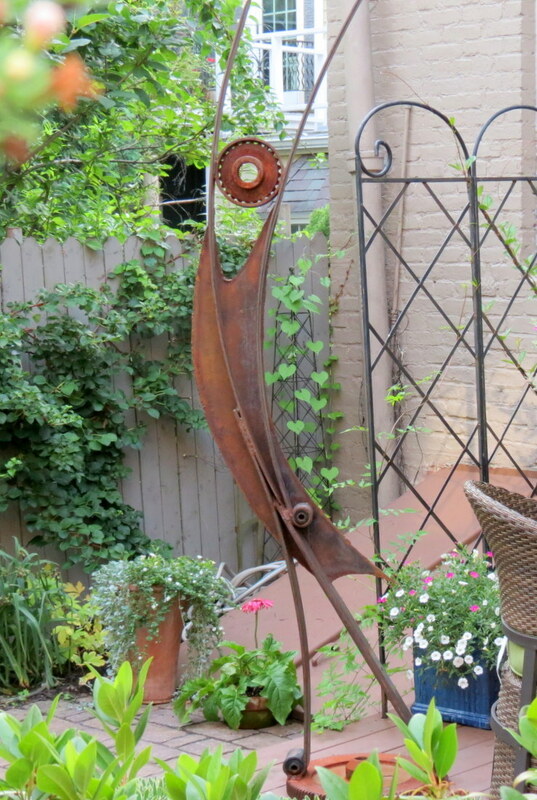 Many other forms of sculpting were on display at Garden Tour locations, such as Fredda Merzon’s botanically-inspired metalwork at the GeLarden garden, Jason Schultz’s work at “Katy Lane,” and Bob Laper’s pieces shown at the top of this posting. I’d like to thank each of the artists who gave time and talents to help make the Garden Tour a success, and my own viewing more enjoyable. 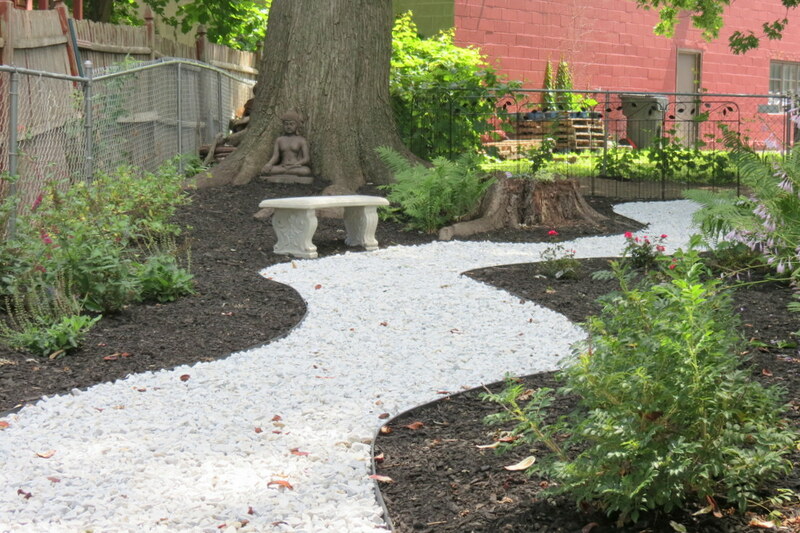 This 4th and last Slideshow features the garden at 142 Front Street, the home of Laurence James and Tina Caruso. The cliche disclaimer “last but not least” clearly applies. . . Tina loves pink (plastic) flamingos, too . .
. . above: chenille-stem (pipe cleaner) art by Ginger Ertz, at 207 Union Street. 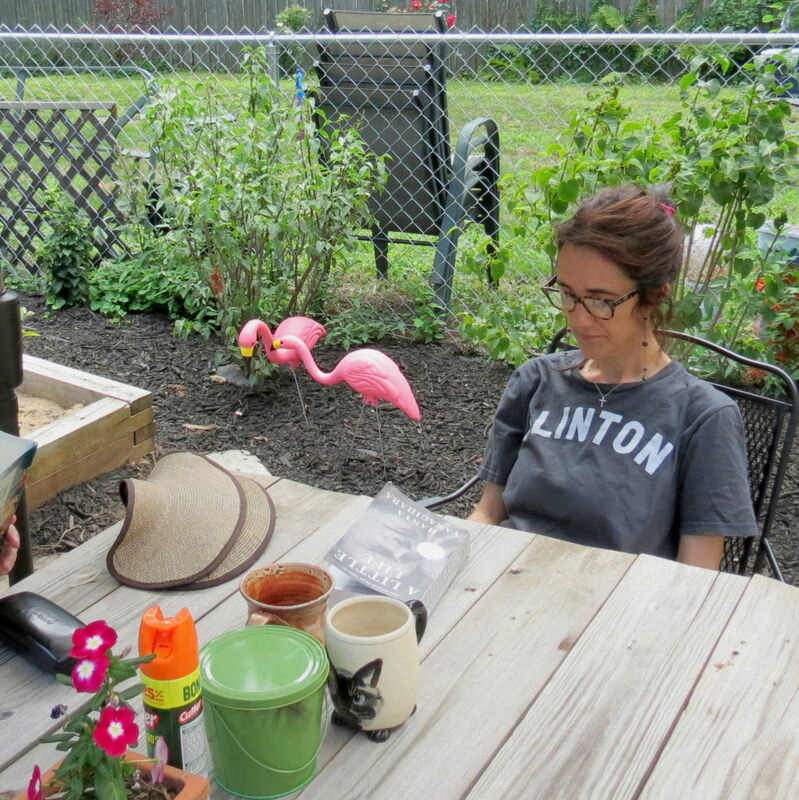 Friday afternoon, July 15, 2016, was hot and humid, with a gray overcast. 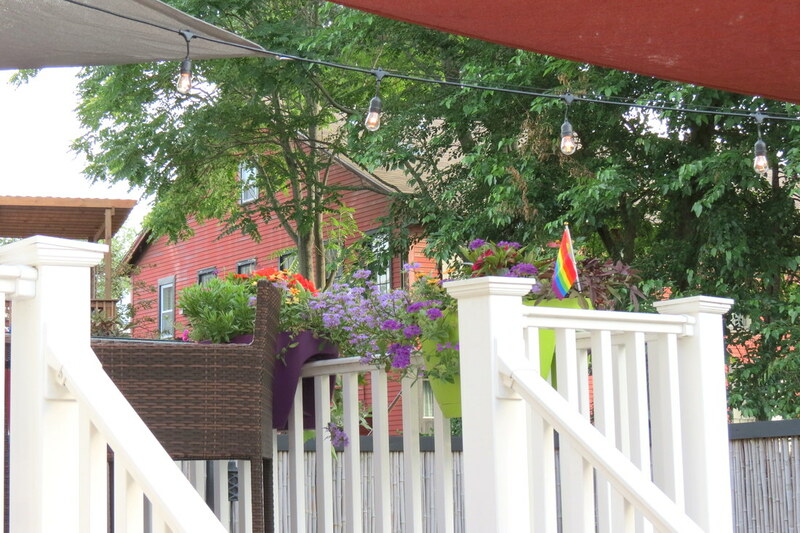 Nonetheless, the streets of the Stockade were blooming with even more Garden Tour guests than Pokemon-Go players from 3 PM to 8 PM. Vowing to return Saturday [today], for the forecasted improved weather and sunshine, I visited only five of the dozen Gardens. You can see, however, from the following Slideshow images, that even under mostly overcast skies, the Tour gardens showed their uniqueness and beauty. 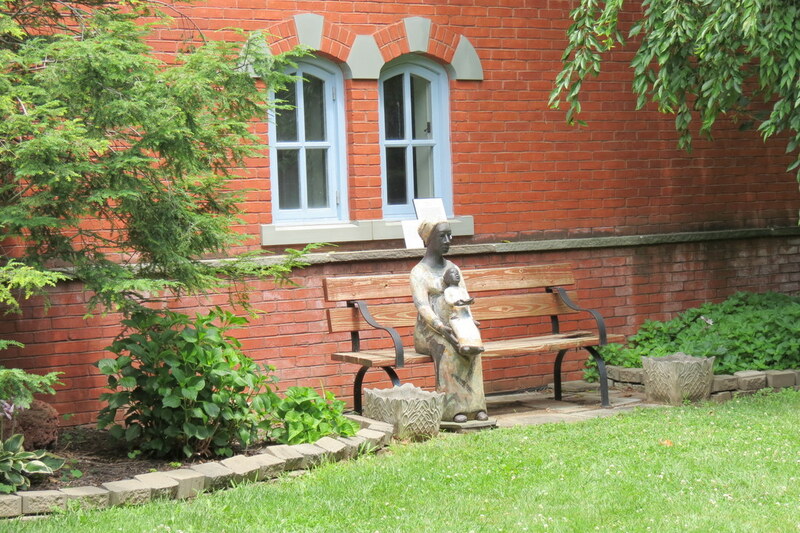 Here are three or four photos of the five gardens I visited on Day One. 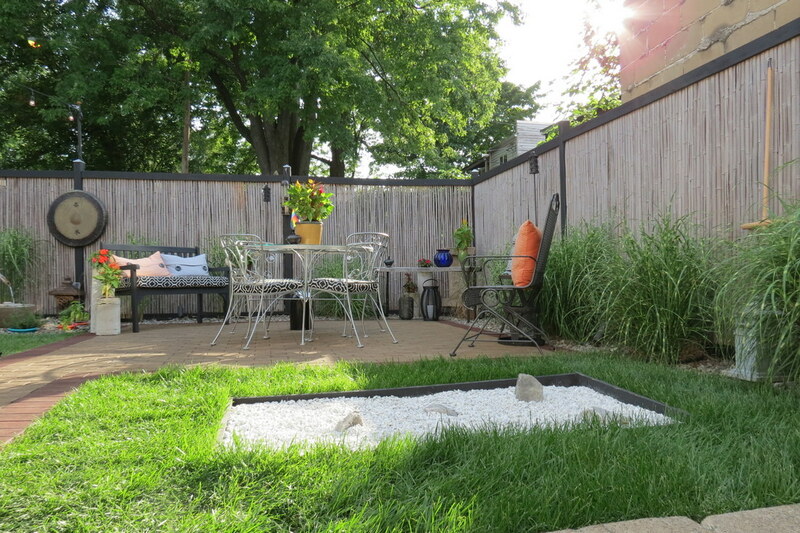 Want More Stockade Gardens? 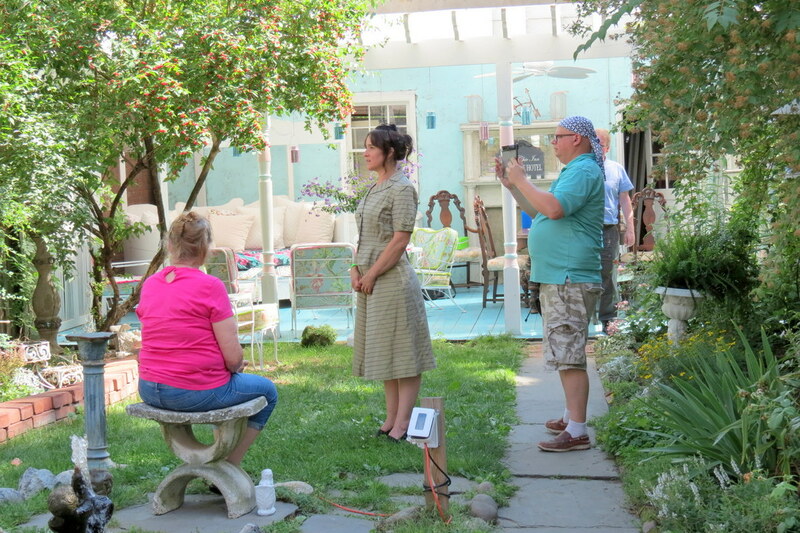 See our Garden Tour Preview, for a glimpse of the 2016 Stockade Gardens about a month prior to the actual Garden Tour. Are the gardens available to view any day? Hello, Karen. Thanks for stopping by “suns along the Mohawk.” Unfortunately, the gardens were only open to the public for the fundraising Garden Show. 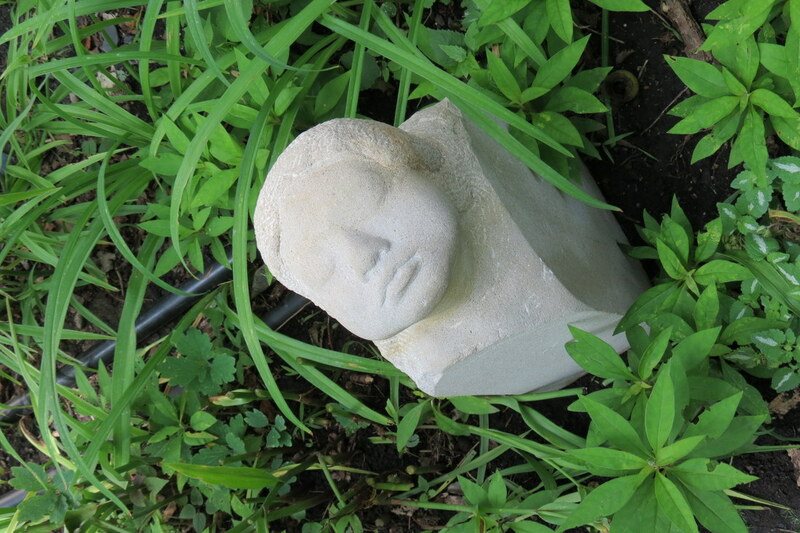 You can see a few of them from a sidewalk or alleyway, but they are otherwise private. This year the Stockade Association is holding a Walkabout event on September 23rd. There will be another Garden Show in 2018. Best wishes.